The holidays are in full swing and the new year is right around the corner. And as some of you may know, the stock market has been a bit shaky in the last month or so. But it seems Magic is still doing pretty well during this slightly volatile time. I think a good portion of that has to do with the ramp up of MTG Arena and the recent esports announcement from Wizards. This is a great thing for Magic as a whole, as it will most likely result in a lot of new players playing the game. 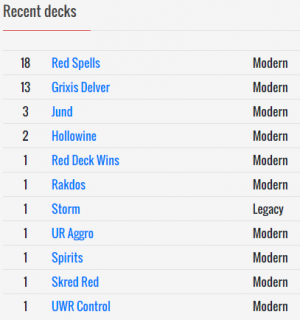 I’m still not quite sure how and if Wizards will figure out a way to convert many of the new players who start out with MTG Arena into paper Magic players. With that said, some people have feared that paper Magic might die off a bit, causing people to start talking about potentially selling their collection. I even thought about doing this myself. But in the end, I think paper Magic still has a lot of potential for many years to come. And as a matter of fact, I think this is a good time to pick up cards that you need or want on the cheap. At least I have. Plus, increased interest in Magic is right around the corner as we start to see even more Ravnica Allegiance spoilers. This has been showing up a bit more in Modern Dredge and Elves recently. And there’s only one printing. But since there’s only one printing, I wouldn’t go too deep on these. We just saw Convoke in Guilds of Ravnica, so we might see more of that in Ravnica Allegiance. But if not, it could be a while before we see the mechanic show up again. Don’t forget about Life from the Loam from article #24. And don’t forget about Collected Company from article #21 and Damping Sphere from article #18. I preordered this from Star City Games. But I only ordered a playset because I think $3 is borderline too expensive. It might be good in Standard. 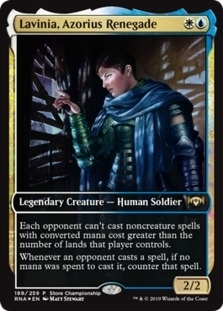 But I’m not sure if it’s good enough for something like Modern Humans since it competes with cards like Militia Bugler, Dark Confidant, and Thraben Inspector. However, it’s a two-mana Human that can help smooth out your draws and sometimes just straight up draw you a card in rare instances. I don’t think it’s reasonable to expect casting this card for its Spectacle cost. 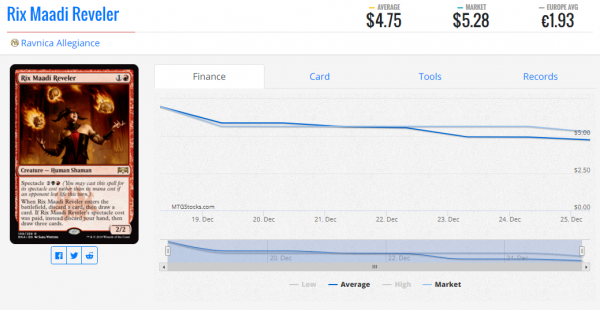 So the question is…will the card filtering warrant a spot? Only time and testing will tell. This seems to be pretty popular in Pauper. And the artwork on this promo is pretty sweet, which will probably never be printed again since we sadly lost Wayne England in 2016. If you need or want these, I found a pretty good deal on eBay. I was a little late to the party on this one. But I was still able to find a playset under $1 each from Miniature Market. 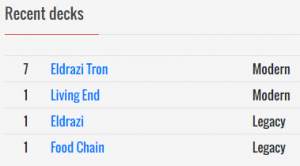 If you need or want them, and you can still find them around $1, that’s probably still a good price to pick them up at since Izzet Phoenix is still trending upwards in Modern. 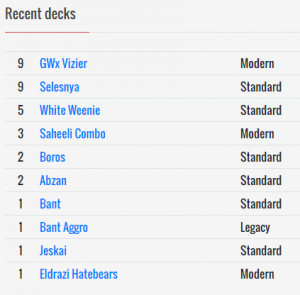 GWx Vizier in Modern has kind of fallen off the radar. But Postmortem Lunge started popping up in list earlier this year in September. 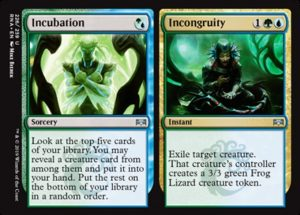 And with Incubation // Incongruity being pretty much a strict upgrade to Commune with Nature, we could see a slight uptick in the deck’s performance in the next few months. Not to mention, Noble Hierarch, Kitchen Finks, Devoted Druid, and Eternal Witness all got reprinted in Ultimate Masters. And Postmortem Lunge is tough to reprint owing the mistake of Phyrexian mana. As just mentioned above, this has taken a huge tumble from its high of over $10 last year. And rightfully so since it was badly in need of a reprint. This not only sees play in GWx Vizier, but also shows up in Elves. I think somewhere around $1 is pretty much the floor for this card unless it gets reprinted again. This has already kind of spiked but has come back down just a tiny bit. I was a bit surprised at how many different decks this sees play in, so I decided to pick up a playset. It’s also a bit harder to reprint owing the unique enchantment creature card type. 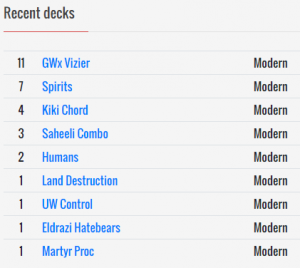 Just like Eidolon of Rhetoric, I was also a bit surprised to see how many decks this sees play in right now. And I also noticed that it’s been featured a lot in recent articles. It’s a sideboard card that costs one mana, making is pretty powerful and easy to consider if you’re deck can support red. This will also just get better over time as more and more lands are printed. This is the only version that comes in a black border with the old card frame unless you go for 7th Edition foils. But those will cost you over $90 each. If I had the money, I would get those. But I don’t, so I’ll stick with my Ice Age ones for now. 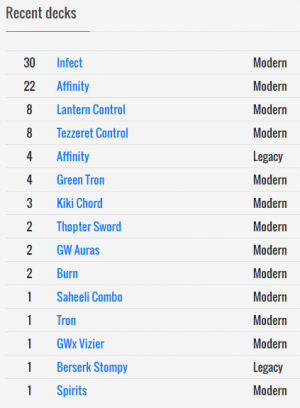 This already sees a tiny bit of play in Modern. But with the printing of Lavinia, Azorius Renegade, we could see an uptick in play with Adarkar Wastes since it helps you more easily cast Lavinia and Spell Queller on curve. 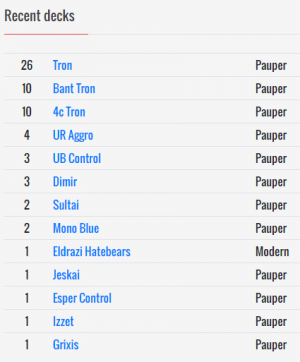 This mainly sees play in Colorless Eldrazi in Modern. 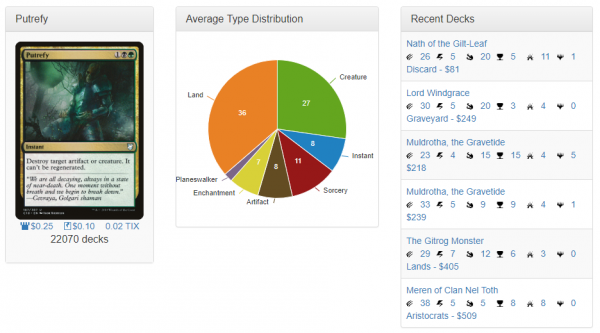 And as more colorless cards get printed, the higher the chances this deck gets more powerful. So it’s a deck to keep an eye on. And don’t forget about Serum Powder from article #18. Foil copies have finally sunk to it’s all-time low, so I think now is the time to pick them up since it sees play in various decks. And I don’t think we’ll see a tutorable Leyline of Sanctity like this for quite a while, if at all. 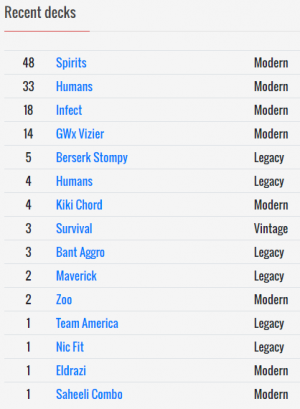 Infect in Modern is still around, especially after Aaron Barich won the SCG Invitational back in June. His list didn’t run Twisted Image. But it still shows up in lists as it’s a pretty clean way to deal with Spellskite, which is one of the tougher cards the deck has to deal with. And it’s a very popular card since it can fit into almost any deck. It’s also a nice way to deal with Noble Hierarch and Phantasmal Image, which are also extremely popular. 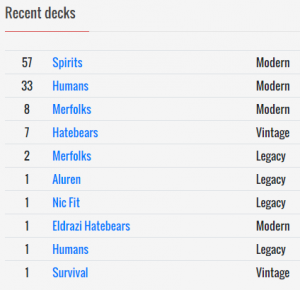 I highlighted Mortify in article #24, and that was a bit too late if you only read the article when it was published instead of checking in on the public MTG Metagame Finance Spreadsheet or keeping a close ear to the Discord channel if you have a membership. Now, I don’t think Putrefy will get reprinted in Ravnica Allegiance since there’s already Mortify and Golgari was a guild that was part of Guilds of Ravnica. However, this is a promo that will probably never get printed again. But the card will most likely show up in Standard again at some point in the future. It’s also highly played in EDH/Commander, showing up in over 22,000 decks.